In the last few months I have found a whole new obsession with hummus. I’m not kidding…I’m eating it with everything! 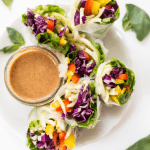 Whether I’m spreading it on a rice cake or enjoying it with some carrot sticks for a quick snack, adding it to my lunchtime wraps, or even whisking it into my salad dressing, hummus has quickly become a staple in my fridge. And what’s even better, there are SO many flavor options to choose from! So no matter what you’re craving, there’s bound to be a hummus option to suit your needs. Oh and I'm also going to visiting the Sabra factory in a few weeks (!! ), so stay tuned for a post all about our trip! 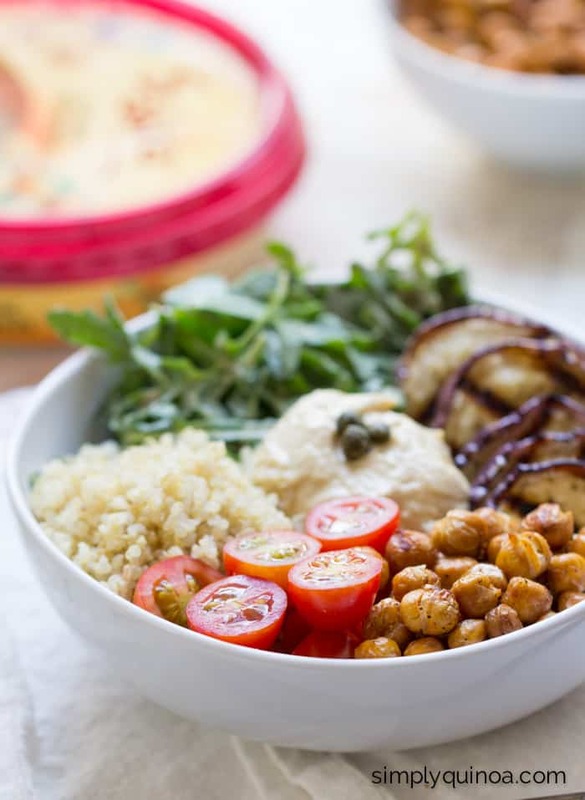 For my National Hummus Day recipe, I could think of no better recipe to make: a quinoa hummus bowl. I mean in case you can’t tell from the archives, quinoa bowls just so happen to be one of my favorite meals of all time. 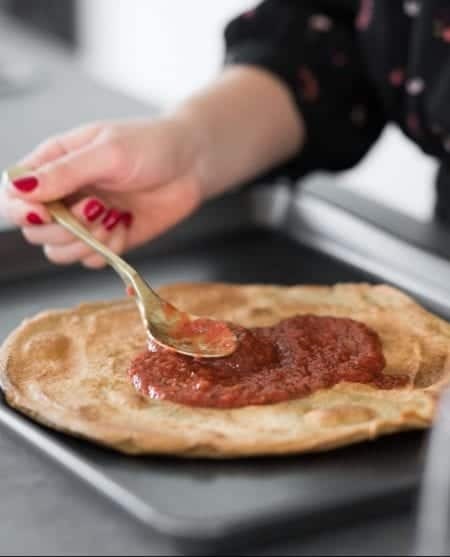 They’re quick, easy and totally customizable to whatever ingredients you have on hand. This go around, I was craving something filling, but with an international spin. While I was shopping for groceries I saw the most spectacular striped eggplant. I just had to have them. 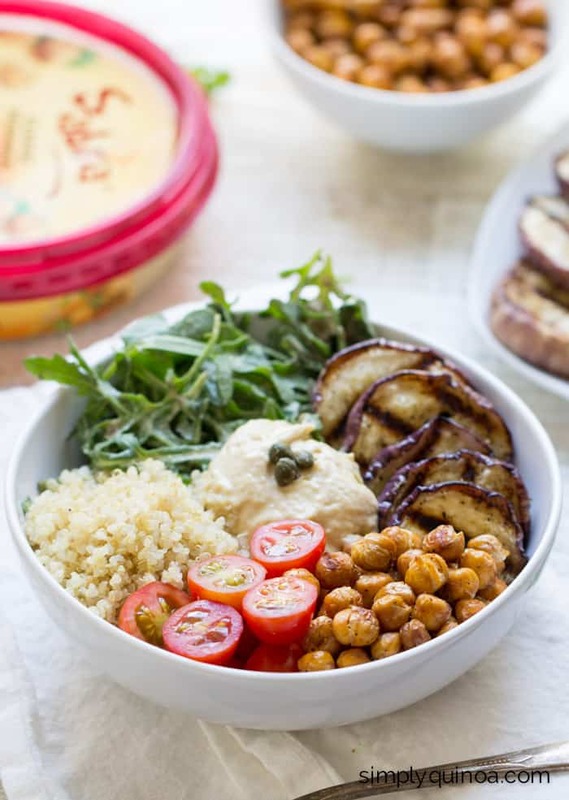 From there, my mind immediately went towards Mediterranean cuisine – hummus + eggplant are the perfect combination. Along with that, I also added some quinoa, chopped cherry tomatoes, crispy roasted chickpeas (<– omg SOO good) and a small arugula salad with a tahini, lemon and caper vinaigrette. Then you just arrange everything in a bowl and dig in. I swear, it might be the easiest meal, but it’s also one of the tastiest. I’ve made it so many times already and love it – especially for a healthy lunch or light dinner. Oh and if you can do dairy, it would also be wonderful with some crumbled feta on top! It might be the easiest meal, but it’s also one of the tastiest. 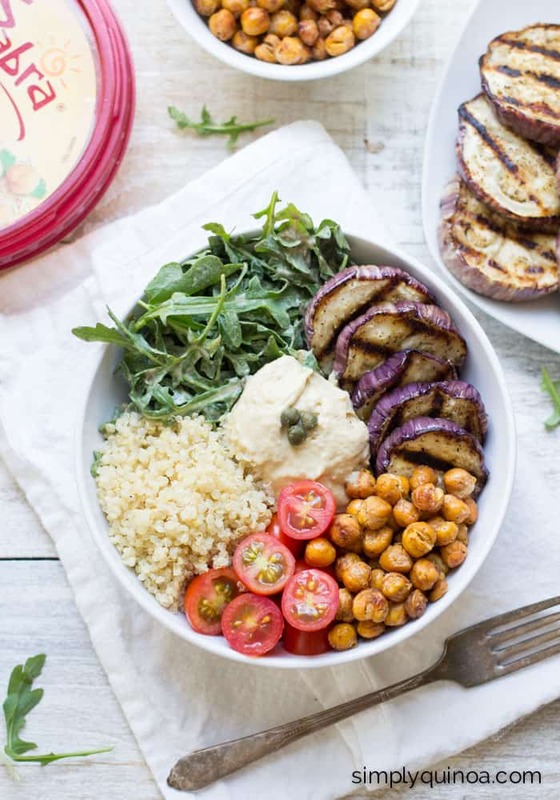 I’ve made it so many times already and love it - especially for a healthy lunch or light dinner. Oh and if you can do dairy, it would also be wonderful with some crumbled feta on top! Begin with the chickpeas: preheat the oven to 350 degrees F. Toss the chickpeas with coconut oil and spices, then transfer to a baking sheet. Bake for 35 - 45 minutes until chickpeas are golden brown and crispy, stirring around a few times throughout the cooking. Let cool and prepare remaining ingredients. Slice eggplant into 1/2" rounds. Brush with olive oil then season with salt and pepper on both sides. Grill over medium heat until seared on both sides, 2 - 4 minutes per side. Transfer to a plate and prepare the salad. Whisk together tahini, lemon, water, tamari and capers. Pour over arugula and toss to combine. 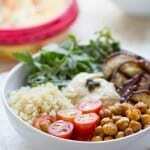 Prepare two bowls, evenly distributing the arugula salad, chickpeas and remaining ingredients (including chickpeas). * I like to make a double or triple batch of the chickpeas and keep them for salads (or as a snack) throughout the week. Just store the leftovers in an airtight container in a cool, dry place. If you make this recipe, make sure to snap a pic and share it on Instagram using #SIMPLYQUINOA – I want to see your own quinoa creations! This post was sponsored by Sabra, but all opinions are my own. I only share brands that I am passionate about, so thank you so much for supporting them! 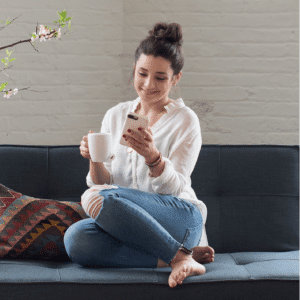 Learn more about Sabra on Twitter, Instagram, Pinterest, and Facebook. My two favorite flavors of Sabra Hummus right now are the roasted beet and the ginger sesame. So good. Where do you live?! I’ve never seen those flavors before!! You could try their website. Quinoa bowls are always so filling. Pinned this! Love quinoa bowls! Pinning this! With no disrespect intended, why would you eat so many healthy foods and then add the Sabra hummus? It is made with soybean oil (Prob GMO) and preservatives. I would love to be able to go to a grocery store besides Whole Foods and buy hummus. Maybe you can challenge them on their ingredients. I love your recipes. 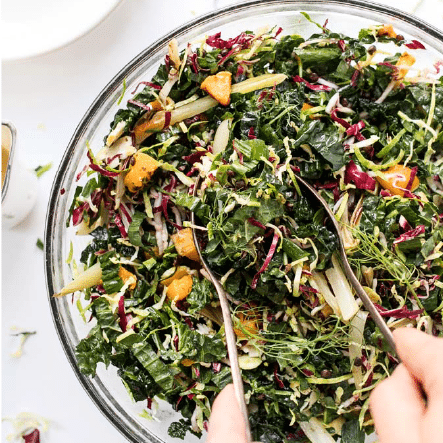 Omg I”m obsessed – love the dressing on the arugula salad, the crunchy chickpeas and those veggies – oh my gosh – gorgeous!! Thanks for sharing this! OMG this looks so good. I love hummus and I love Sabra brand! I want to dive head first into that bowl!